This article submitted by Josh Jones on 2/23/99. On Friday, Feb. 19, the Paynesville Bulldogs boy’s basketball team hosted the number one team in class AAA. That’s right, the Litchfield Dragons were in town. 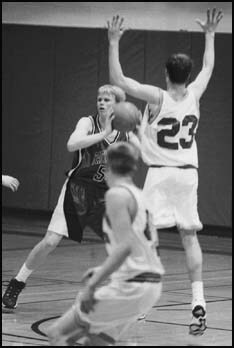 The last time the two teams met, Paynesville had the jitters and didn’t play well at all. Litchfield defeated the Bulldogs 63-39. In the first quarter, Paynesville played superb and at times were even ahead. The Bulldogs were playing awesome defense and were handling the Dragons press very well. The quarter ended with the Bulldogs only down by five points. The second quarter brought bad news for the Bulldogs; however, with the officials letting Litchfield play hands on defense which in turn gave Litchfield a lot of steals and points, giving Paynesville only two points that quarter. In the third quarter, Paynesville started to play well again. The officials called the game better and Paynesville had a chance to bring the ball down the floor. Paynesville only lost this quarter by four points. In the fourth quarter it looked like the end for Paynesville. They spent the rest of the time digging themselves out of a hole that they fell into in the second quarter. The Bulldogs came up a few baskets short, but won the fourth quarter. The final score being 63-39. On Tuesday, Feb. 16, the Payneville Bulldog boy’s basketball team took a trip to Sauk Centre for another conference game. In the first quarter, the Bulldogs jumped out early and controlled the game with the score at 10-3. In the second quarter, the Mainstreeters fought back and at half-time the score was 22-9 in favor of the Bulldogs. The third quarter was a bit frustrating for Paynesville because the Mainstreeters kept finding a way to come back. The fourth quarter seemed to take forever with the amount of fouls that were called. A total of 48 fouls were called in the game. If you don’t know a lot about basketball, this was a lot of fouls! Free throw shooting won the game for Paynesville as they shot 80 percent (32/40) and set a new school record. Over half of the points Paynesville scored were from the free throw line. Paynesville won this battle 63-54 over Sauk Centre.